When I made the decision to commit myself to playing regularly this year, I knew that at-home practice would be key to my success and enjoyment. Financially and logistically, there's not much I can do to get to a "real" course daily. Right now, I make time to practice during the 1-2 hours I get to myself while the little one naps. Today I'll share with you what I've found that works for me as well as what gaps I believe I still need to fill in to get the best golf practice possible at home. Disclaimer: I was not asked to review these items by any of the companies listed. I have no affiliation with them. I purchased them with my own money after doing my own consumer research. The links provided are not affiliate links; I will not earn anything from readers purchasing the items or even visiting the links. These opinions are entirely my own, and are just that: opinions. I chose to go with the SKLZ brand of golf training tools. In my last season coaching the college team, we invested in a number of their items and I found that they held up very well the course of a year, even with 20 athletes sharing them and using them 3-5 times a week. So I felt confident in the investment, and didn't really shop around too much for comparable brands. 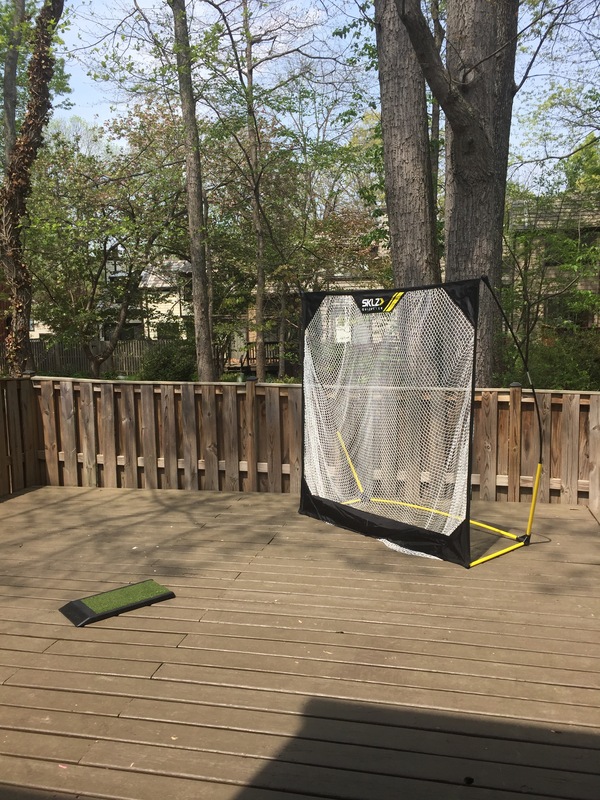 Our deck is spacious, leaving enough room for full swings with a net. I picked the 6x6 foot Quickster Net, which assembles and disassembles in mere minutes. For someone of my height (5'6") and strength level (slow-to-medium swing speed), it's more than adequate for taking hits with wiffle balls. If I weren't in a town home with the windows of my neighbor's homes around me, I would totally try to stake it down and hit with real balls, but the practice balls work fine. I purchased them several years ago and they can be found at many major retailers. On a side note about practice balls, I wouldn't over think them. If you use the net, you won't get to see how they fly anyway. SKLZ makes nifty foam ones that we used which were nice because they had lines you could aim with and they held up very well, but I'm doing just fine with my wiffle ball version. Next, I purchased the Glide Pad for my hitting surface. What I like about the Glide Pad is that it is designed to give a little to simulate what it is like to hit a divot off real grass. My players loved this because it doesn't feel like the mats you hit off of at driving ranges, and those with wrist or elbow injuries didn't need to hold back. My only gripe is that to use it, you must grip down a little on your clubs because the mat is a little higher than the ground. SKLZ makes a Stance Trainer that allows you to stand at the proper height for the Glide Pad, but I passed. For putting, I bought the Accelorator Pro Compact putting mat. This is a smaller version than the one my team used, which had a nifty little ball return. But, I like this one better. It feels a little more durable, and honestly how often will I putt completely straight flat putts outside of 3 feet anyway? The last thing I bought was a three-pack of Eye Line's Ball of Steel. Five times the weight of regular golf balls, these are fantastic for drilling in the feel of accelerating through the ball with a square face. I love the feedback it gives and how quickly I can correct errors myself. Proper chipping practice. I feel like chipping to a net or basket is good for drilling proper impact, but honestly you really need to see how balls land and react on greens to develop your feel. Chipping is such an essential scoring skill! Bunker practice. Again, nothing compares to the feel of sand beneath the club head. Long putts. Not to be super repetitive, but its hard to replicate the feel of lagging a breaking putt on a real green. SKLZ does make a long putting mat to try to answer this problem and I used it with the team, but we never really liked it and it is pretty bulky to store and takes a little longer to set up. I also don't think it's as durable as their other products. So there you have it, a run-down of the bare necessities of my home golf practice set-up. It all fits easily in the corner of a closet when not in use, and should last me several years so the cost will be worth it over time. Do you have any at-home practice tool that has been essential to your game? Share with us!